Bolton Wanderers’ form this season has seen them occupy Champions League places in the league and reach an FA Cup semi final, a fantastic achievement. Much of their success has been attributed to Owen Coyle, who, after joining the club in January 2010, has won many admirers for his style of football. The fans are supposedly coming to see a new brand of free flowing, attacking football; gone are the days of the direct football witnessed under the management of Sam Allardyce. That, however, is not entirely true. This season, Bolton have averaged 73 long balls per game, the fourth highest in the Premier League behind Birmingham, Blackpool and Tottenham. Last season (when Gary Megson took charge of just under half of Bolton’s games) the team averaged 71 long balls per game; the ninth highest in the division. The difference between the two numbers is statistically insignificant; over a full season under Owen Coyle the team were not playing any less direct than the season before (unfortunately data is unavailable from 2008/09). Although there are signs that the team are less reliant on set pieces – the total scored from such situations has fallen from 48% in 2009/10 to 27% in 2010/11 – one cannot escape the fact that Bolton continue to play some of the most direct football in the league. 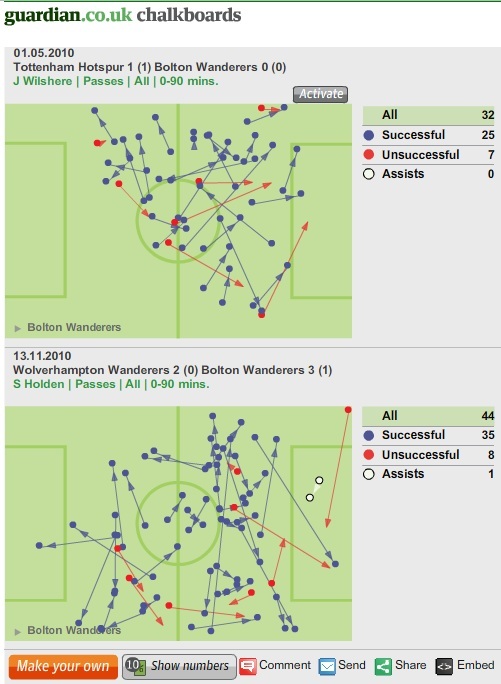 So what makes Coyle’s Bolton masquerade as an exclusively pass-and-move, short-ball side? The answer can be found in a chalkboard comparison of Gary Megson’s struggling Bolton and the team currently managed by Owen Coyle. In the above and linked chalkboard, there are few passes around the middle of the pitch by Cohen, evidence of the ball earning frequent flyer miles from defence. Cohen never really took control of matches as a central midfielder; perhaps a reflection of the low confidence within Gary Megson’s side creating a vicious cycle of a team unable to assert itself in matches. 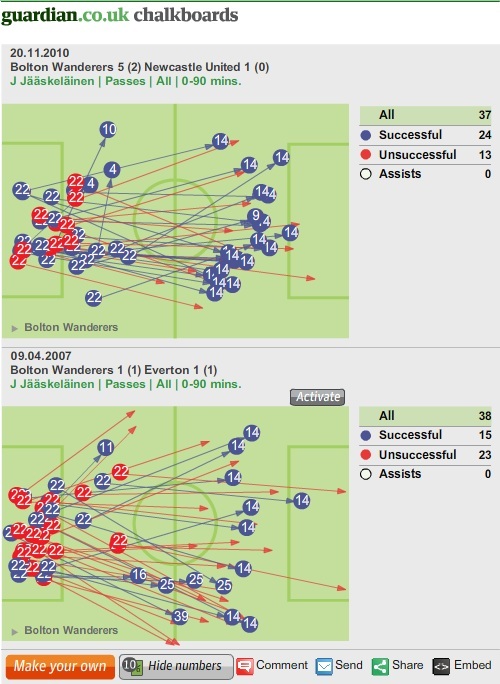 The development of two players allowed Owen Coyle to solve this problem area. First, the loan signing of Jack Wilshere – and importantly his move to a central position at the end of last season – gave Coyle a player with an ability to keep the ball in midfield. Holden has probably been Bolton’s best player this season, and his injury in March hopefully won’t prove a barrier to progress next season. That is not, however, a criticism of Bolton at all. This is a team who have shown an ability to ‘mix it up’, keeping the ball when required but also utilising a potent asset in Kevin Davies, who continues to be one of the best at what he does in the league. It would be very easy for Owen Coyle to refuse to play direct football simply as a knee-jerk to fans’ and the media’s demands; instead he’s infused his philosophies into the team and exploited the squad strengths, creating a team that comfortably sits in mid-table. Goal type and long ball statistics are courtesy of the excellent whoscored.com, which provides extensive match data and analysis. 2010/11 league position correct as of 10/05/11. My blogging frequency will continue to fall over the coming months due to exams, but please feel free to suggest topics via Twitter or Facebook. As ever, thoughts on Bolton Wanderers and this piece are hugely appreciated. Interesting stuff as usual. Put me in mind of those oft-recycled Kevin Davies stats – he has committed more fouls than any other player in Premier League history. But there are also some stats, which haven’t been made any more concrete by my very brief google, that he has something like 200 more flick-ons than any other Premier League player, and has created the most chances from open play. I suppose it’s all about using your resources wisely – Coyle has his own preferred style, but he’s still a pragmatist in the sense that he knows that Davies’ target-man ability is well worth utilising. Thank you. Yes the stats can be a dangerous game – for instance who did those flick-ons go to – but they give you a broad idea and I think it’s important to say that this is not a Bolton which is the polar opposite of the side under Sam Allardyce, and shouldn’t be either. I’ve not really looked at it and don’t remember it too well, but perhaps Allardyce didn’t use his resources too well at Newcastle – you’re spot on Coyle’s been pragmatic and sensible about his own resources. I think another difference between the megson years and the coyle years is that Bolton are making a lot more tackles higher up the pitch now. 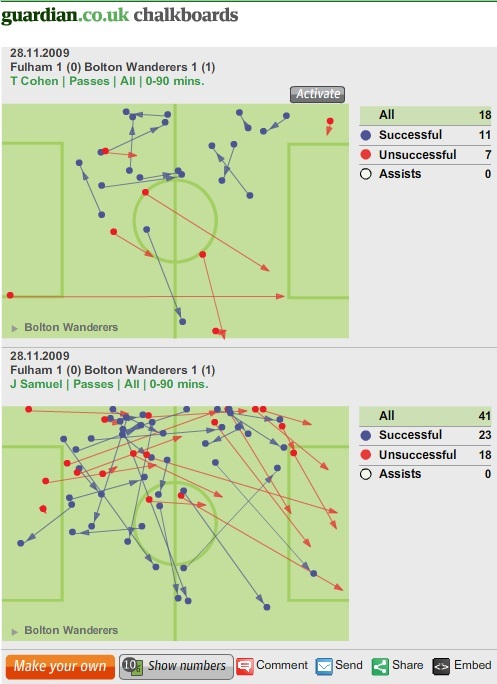 A look at the chalkboards shows that Bolton are making about 8-10 more successful tackles a game in the midfield and attacking areas of the pitch than they were under megson, about 22-28 a game rather than 14-18. And clearly, if you win the ball in midfield or your opponents half you don’t need to play a long ball as often, as there isn’t the danger of making short passes in a dangerous area, like there is if tackles are made near to your own goal. Interestingly, Bolton aren’t winning a higher percentage of tackles now than they were two years ago, they are simply committing more challenges and pressing higher up the field. And by doing so, as much as anything, Coyle’s team doesn’t confine itself to playing the long ball for the majority of the game. Very true. Another reflection of that is of this chalkboard of clearances I’ve quickly put together: http://www.guardian.co.uk/discussion/comment-permalink/10695086 since clearances also give a clue about how deep a team defends. I had a look at a few home games and the trend was the same as the two I’ve picked out, though they’re obviously more blatant examples. It’s more evidence of Coyle’s ‘attacking mentality’, no doubt helped by the form of Gary Cahill and Zat Knight. As a Bolton fan who can’t attend games very often this makes for very interesting reading. Aside from the FA Cup semi-final (where we just didn’t turn up!) the games I’ve seen us play completely support what you’re saying. I hate people who resort to slagging Megson off – at the end of the day he was brought into Bolton to do a job (keep us up) and he did that by turning losses into draws. The struggle came the following season when he couldn’t push on from that. Coyle took a team with a solid defensive base and as Hansen often says, “a great spine through the team”, and added players who would complement that. Although people seem to think Bolton have transformed into a team which suddenly plays attractive football we still have many similarities to the often criticised Stoke City. Both Coyle and Pulis recognise the basis of their teams which is required to retain Premier League status – the focus for both teams every season – and incorporated a free-flowing side to accompany it. I think the issue under Megson was (as Adam says) playing deeper and seeing the long ball as the only solution whereas Coyle has encouraged his team to knock it about more, not be afraid to try a run and beat a man but also not to ignore the staple asset to the team, SKD. Whilst we have lumbering forwards (SKD, Elmander, Klasnic) who can trouble defenders in the air, there is now also the threat of pace and skill (Lee, Sturridge, Holden) and experience (Petrov) as there was under Allardyce. Not that I’m saying the glory days of Europe will return without major investment (which is always risky), but I’m very happy going into next season if Coyle remains at the helm. Finally, let’s get Super Kevin Davies back in the England set-up!